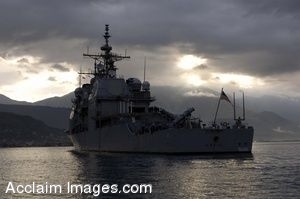 Description: Clip art photo of U.S. Navy Sailors manning the rails aboard the guided-missile cruiser USS Anzio (CG 68) as the ship pulls into Tivat, Montenegro, Oct. 23, 2006. Anzio is the first ship to visit Tivat since 1975, making this visit a significant step in the strengthening of partnerships between the United States and Montenegro. DoD photo by Mass Communication Specialist 3rd Class Matthew D. Leistikow, U.S. Navy. Stock photography by Department of Defense Public Domain.